'You don't want to drop the first game, but we did. Now we have to do something about it.' - Clippers coach Doc Rivers. 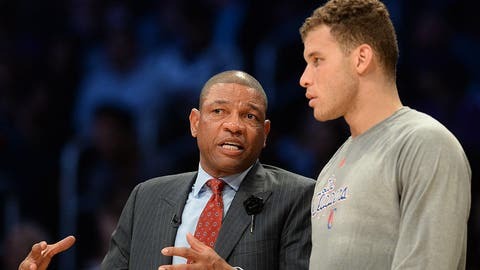 PLAYA VISTA, Calif. — Two weeks before the playoffs began, Clippers coach Doc Rivers warned his players that they probably would lose a game at home. He just didn’t think it would happen this quickly. No one did, of course, but now the Clippers are down 1-0 in the best-of-7 first-round Western Conference series against the Golden State Warriors. That makes Game 2 on Monday night on Prime Ticket (starting at 7 p.m.) — well, a must-win game. At least Rivers could say he knew it was coming. "I didn’t mean that," he joked Sunday morning before his team practiced. Actually, he did. Teams understand that a long playoff run is seldom a smooth ride. It’s full of bumps along the way, and the Clippers absorbed a big one in losing 109-105 on Saturday. "You have to be prepared for that, obviously," Rivers said. "You don’t want to drop the first game, but we did. Now we have to do something about it." Game 1 victories offer no assurances. Last season, the Clippers won their first two playoff games at home against the Memphis Grizzlies, only to lose four in a row and get swept in the opening round. But losing Game 1 at home is never a good place to be. "We’re OK with that," guard Jamal Crawford said. "The way we lost, we kind of beat ourselves a little bit. Give them credit. They did a good job, but everything that could go wrong at the end did with free throws and turnovers. "It’s not a team you’re going to sweep. They’re a good team, obviously. They won 50-plus games in the Western Conference. We understand that." The day after, the Clippers certainly found lots to fix. They shot 42 percent, made 17 turnovers (including six by Chris Paul), gave up 25 second-chance points and missed 12 free throws. In the final minute of the game, they were uncharacteristically out of sorts. Maybe, as Blake Griffin said, they were just a little too amped up. "You want to win so badly, you want to maybe try to do a little too much at times," he said. "We’re all guilty of that. But I think we just got away from it. I’m not sure exactly where, exactly why. With all those mistakes and all those things, we were tied with a minute 30 (seconds left), so that’s encouraging." It didn’t help that Griffin and Paul spent most of the game in foul trouble. Griffin was reduced to just 19 minutes on the floor after picking up three fouls in the first half and finished with 16 points. Without his impact on offense or defense, the Clippers had problems at both ends. "I thought the game was called very close," Rivers said. "Unfortunately for us, our two best players were the ones that (bore) the brunt of that. Chris in foul trouble, Blake in foul trouble. When Blake plays 19 minutes, that wasn’t in our game plan. I didn’t have that in my notes. I did effect us." But with game officials calling the game so tightly — most likely in response to the bad blood between the teams — Rivers said he won’t ask Griffin to alter his style of play. "Blake needs to play more aggressive, even more intense, and not go the other way, Rivers said. "I actually thought two of his fouls came from not trying to foul. You could see he was trying to stay out of the way." Asked what he will tell his team before Monday’s game, Rivers said, "The message is just go play — not all this, do you become calm, do you become intense? You just go play as hard as you can and with great focus and intensity and great energy. Then it’ll work out."